Time and time again, I'm a sucker for cheesy names. The same goes for impressive or unusual label artwork. You give your beverage a silly name or give it a crazy label and consider it purchased! I will buy it. I'm not really sure if it's just some sort of weird fascination of mine, because most times if I buy something with a cheesy name or neat artwork I don't really expect much. But sometimes, these random purchases can yield something great. Enter Cupcake Vineyards. I had seen their wines on the shelves before, but they never really caught my eye. Perhaps I just didn't see that it was Cupcake Vineyards, that's a silly name if I ever saw one and exactly the kind of random purchase I'm likely to make. I don't know why they're called Cupcake Vineyards, it's likely a marketing ploy. All I really know is that their Wine Director is from Australia and spent years making wine before coming to California, actually giving this silly-named vineyard some credibility. After browsing the Cupcake Vineyard wines, I chose the most obvious choice (ie. silliest name), Red Velvet. To refresh your memory, real Red Velvet cupcakes are deep red with luscious cream cheese frosting and are pretty much the best kind of cupcake eveeerrrrrrr. 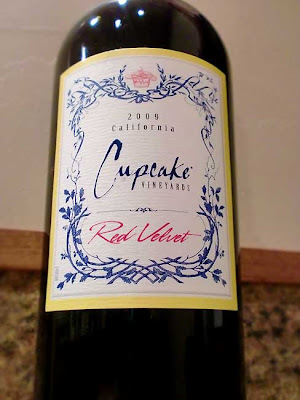 But unfortunately, Cupcake Vineyards' Red Velvet wine is not made from real Red Velvet cupcakes. A bummer, I know. Instead, this is a red wine blend which is comprised of 47% Zinfandel, 29% Merlot, 19% Cabernet Sauvignon, and 5% Petite Sirah. The 2009 vintage of Cupcake Vineyard's Red Velvet wine pours a clear, intense purple. It has aromas of dark raspberries and mocha. On the palette, I get a deep raspberry and blackberry notes, cocoa, a touch of vanilla and a soft earthiness. This is medium to full-body, with moderate tannins. While it really isn't anything extraordinary in objective terms, there's something I find oddly alluring and pleasantly drinkable about this. This is not a special occasion wine by any means, but I did it enjoy it quite a bit and will probably buy another bottle. It did make me more curious about Cupcake Vineyards' other wines, prompting me to purchase a couple of their others (reviews for those will be coming, too). Drink This: if you want a sweeter, fruit forward red wine blend. It was much better than I was expecting. And yes, I guess you could say it does share some characteristics with Red Velvet cupcakes. Don't Drink This: if you want something that tastes like real Red Velvet cupcakes. Just go buy a cupcake instead. Or better yet, drink this while eating your cupcake. Best of both worlds. I recently tried this wine and thought it was great. Nice and smooth and would go great with chocolate or even cheesecake.